Perform the following on the primary server, wherever the iSCSI Target server is online at the moment. From Server Manager, navigate to File and Storage Services and select iSCSI. 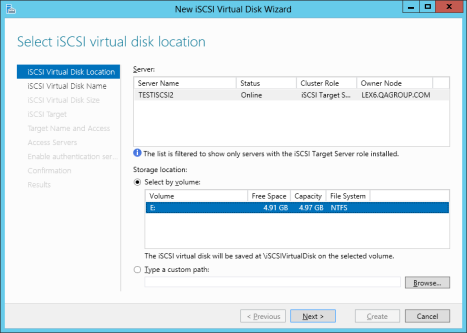 Click on the link “To create an iSCSI virtual disk, start the New iSCSI Virtual Disk Wizard”. (Alternatively, select New iSCSI Virtual Disk from the TASKS drop-down menu on the upper right of the screen.) Note: Windows Server 2012 Server Manager inherently takes some time to display or update the information presented to the user. 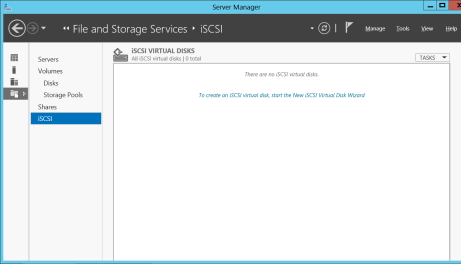 Follow the next panel to configure the iSCSI Virtual Disk. a. Specify iSCSI Virtual Disk Name. d. Specify iSCSI Target Name. e. On the Access Servers screen, select Add. Add the iSCSI Initiators that will be accessing this iSCSI Virtual Disk. Note: The iSCSI Initiators should be added one at a time. Once all the answers have been provided, the iSCSI virtual disk/target creation is complete. Proceed to configuration of the iSCSI Initiator. It is also possible to set up multiple iSCSI virtual disks within the same iSCSI target name. Whenever an iSCSI initiator connects to such a target, it will connect to all of the virtual disks that have been assigned to that name. You need to have a plan ahead of time that describes which files you want to create and whether those files should all be accessed simultaneously or if the disks need to be accessed separate from one another. To set up multiple virtual disks within the same target name, on Step 3c, instead of selecting New iSCSI Target on the Assign iSCSI Target screen, select Existing iSCSI Target and specify the iSCSI target name that was created previously. This target name will appear in the list of “targets” when an iSCSI Initiator connects to the iSCSI Target Server. If a target has more than one virtual disk associated with it, then the initiator will get a connection to each of those disks (they will appear as a new Disk in Disk Management).